Jimmy (partial face on the far left), Barbara, Karen, me, and older sister Mary in the back. I grew up in the 1960s, and until I was almost 10 years old, I absolutely believed in Santa Claus. My older brother, Jim, and I shared a bedroom that was right over our garage, so it was chilly in there on winter nights, and you could always hear the door below rumbling open when Dad got home late. Our beds were under the two windows, and during the holidays each had a plastic plug-in candle glowing on the sill. I recall burrowing under the covers on Christmas Eve, asking Jim if he thought Santa would come soon. 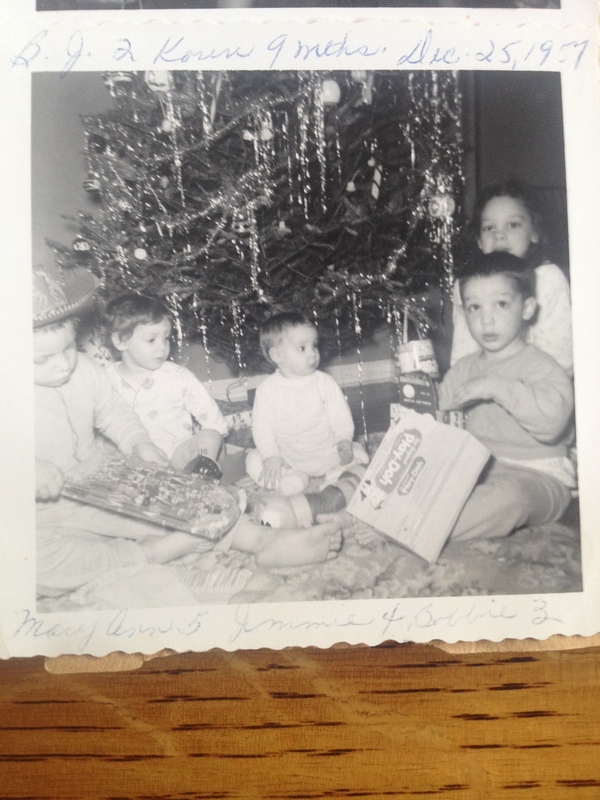 Jim, 10 years old, already suspected that Santa, like the Tooth Fairy, the Easter Bunny, and Bigfoot, was a fiction. “How’s he get in? We don’t have a fireplace,” I said, worried. I thought that not only unlikely, but impractical in the extreme — how could Santa possibly carry enough keys to get into all the houses he needed to visit on Christmas Eve? “Whatta you think, Bobby?” he grumbled, tired of baiting me. At age eight and a half, that was good enough for me. 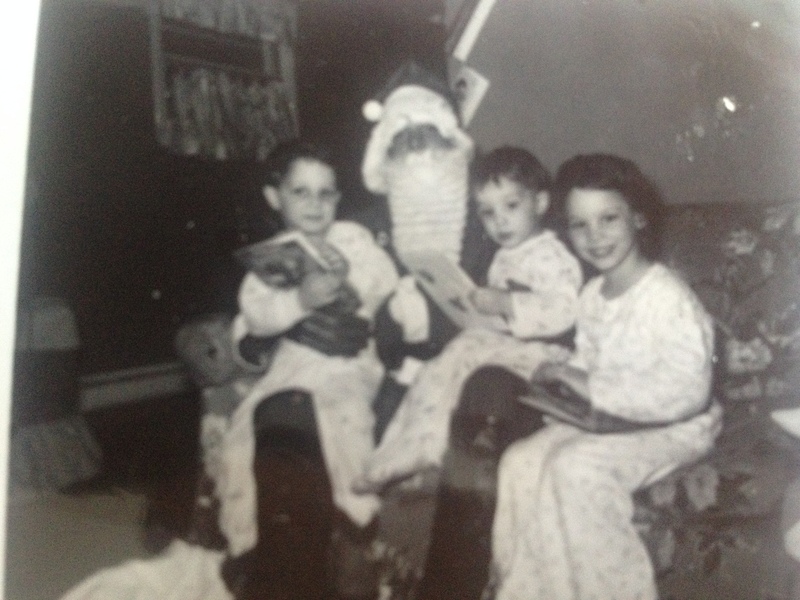 Jimmy, Santa, me, and my older sister Mary. The next year, two weeks before Christmas, I raised the subject again. By now, we’d seen “Miracle on 34th Street” and I knew Santa’s existence was a real subject of debate. I’d heard rumblings around the schoolyard too — the ranks of nonbelievers were growing. It was a Saturday afternoon. Mom had gone to the store, and Dad was upstairs asleep. For the past few years, right after Thanksgiving, he’d taken a part-time job stocking shelves at the local toy store. He always got home after we were in bed, so on Saturday he got to sleep late. Jimmy tugged at my sleeve, urging me down the basement stairs. Nothing amiss — Mom’s sewing machine was off in one corner, and the washer and dryer in another. In the center of the room were two long folding tables pushed together and piled with junk. “Over here,” Jimmy whispered, pointing at one lumpy pile covered with a sheet. He lifted the bottom, peered up, and waved me inside. I could hear my breath in the dim humid space, and my heart kicked over in my chest — the sheet hid a stack of games and toys in gaily-colored boxes. It was as if he’d said the sun wouldn’t come up any more, or that grass didn’t grow in the spring. At the same time, though, it made total sense. I couldn’t deny the obvious. A few nights later, as we slept in the orange glow, I heard the rumble of the garage door. I could hear Mom’s voice and Dad laughing about something, so I knelt at the head of my bed and peered out the window. Up close I could see the fake wax drips molded into the body of the candle, and the bulb, like a miniature sun, warmed my cheek. Dad’s brown Fairlane was backed up to the garage with the trunk open, and he and Mom were carrying boxes into the basement. “Till next year!” Mom prompted, smacking him affectionately on the cheek. Dad worked for the electric company, climbing poles for a living. We lived okay, but he didn’t make enough money to buy all the toys and dolls and bicycles six (later seven) kids expected to see under the tree at Christmas. 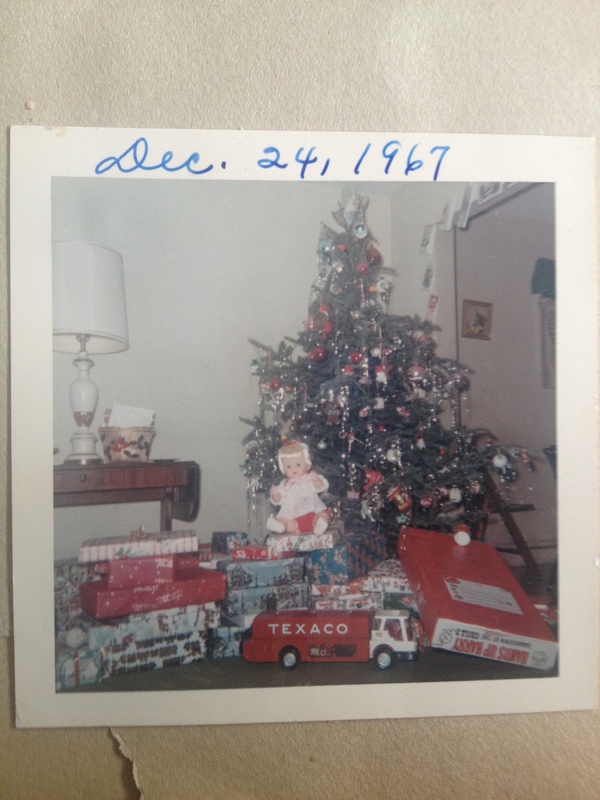 The shelf-stocking job was four nights a week, 6 t 10, and they paid him in toys. Jimmy was wrong. There was a Santa Claus, and he was full of magic. He came into our house right through the garage door. Good memories Bob from one Cresskill Smith to another! I was Mary Ann’s friend and spent time at your house!!! Merry Christmas to you and all the Smith siblings! Thanks for sharing those memories and pictures, reminds me of my sisters and I. Have a great Christmas.